If you are close to completing the requirements of your program, you should be thinking about Convocation. The Convocation ceremony at the University of Regina occurs twice a year – once in the spring and once in the fall. Convocation is the ceremony at which students receive their diplomas/degrees and are welcomed into the Convocation community in front of friends and family. If your application is received between August 1 and January 31, and you will complete your program requirements by April 30, you are eligible to attend Spring Convocation. If your application is received between February 1 and July 31, and you will complete your program requirements by August 31, you are eligible to attend Fall Convocation. View the Application Form (193 KB) . Hill student can apply to have an "International" designation on their degrees IF they have had an "international experience" after being admitted to the U of R (ie: gone on an exchange or study abroad trip) and have taken BUS 308. Find out how to add this to your application for convocation here (193 KB) . Please check your U of R e-mail for grad photo announcements and keep your eyes open for posters announcing times when you can get your graduation photo taken. These are also the photos used for the composite of all degree graduates that we hang on the wall. Click here for further information about the convocation process. Students convocating with the Bachelor of Business Administration (BBA) or Diploma of Business Administration (DipBA) must have a Program Grade Point Average (PGPA) of 65% or higher. Any questions regarding this policy should be directed to the Hill School of Business at 306-585-4724 or through our online contact form. Learn more about scheduling your graduate portrait session. 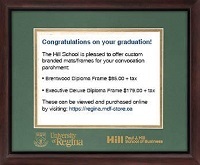 The Hill School is pleased to offer custom branded mats/frames for students' convocation parchments. These can be viewed and purchased online by visiting: https://regina.mdf-store.ca.